If it’s been over seven years since the last time your home in the Raleigh area was painted, it’s time to reach out to the expert exterior painters at Osborne Painting! 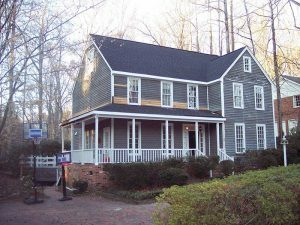 For over twenty years, Osborne Painting has provided premier exterior painting services in Raleigh, Cary and nearby Triangle locations. All window screens, downspouts rain gutters, and shutters are removed to pressure wash your home, completely removing all dirt and mildew. A complete inspection of the surface of your Raleigh home is performed to identify areas that may need repair before the exterior painting begins. Any issues are brought to the homeowner to discuss restoration and repair options. Peeling paint is scraped off and sanded; all bare wood is primed with an exterior primer. The entire house is then completely caulked to seal all cracks and prevent future cracking. First, we remove all window screens, rain gutters (by request or if damaged), downspouts and shutters and thoroughly pressure wash your Raleigh area house completely to clean off all mildew and dirt. After cleaning, we conduct a thorough inspection of the house to find any wood that needs repair. We then notify the homeowner of what we find and discuss the options. Remaining paint is then scraped off and we sand all of the edges and prepare the surface with an exterior primer — this seals the bare wood. As a part of our service, we then caulk the entire house completely, which ensures that no moisture will penetrate beyond the outer wood surface. We can also check and repair any window glazing that needs attention. We conduct our home exterior painting in Raleigh, Wake Forest, Durham, and beyond almost entirely using brushes. Exterior painting with paintbrushes is almost always preferable because the paint is forced into the surface of the wood by the brush, which ensures all surfaces are sealed completely. This means that your paint will be more resilient and your home’s exterior more resistant to moisture. During the process, we use drop cloths if needed and we clean up the job site thoroughly when we are done.